Sydney Destination Drives | Are You Selling? Even in sunny Sydney we all tend to get itchy feet if we’re caught in the routine of city life. Sometimes it’s hard to imagine having the time and energy to get away on your precious days of freedom. Luckily, there are some sparkling gems you can venture off to that won’t take you more than an hour in the car from the city centre. If you’re selling your car in the Sydney area, perhaps these are some good options to add some adventure to your life without putting too many more miles on the ol’ odometer. The first option lies only 17 kilometres and 25 minutes south of the CBD. La Perouse is home to a few treasures that can be enjoyed for a full day or experienced on a short and sweet visit. Take the M1 south and exit on Wentworth Avenue towards Maroubra. Turn right on Bunnerong road then continue straight on Anzac Parade until you hit the car park at Bare Island Fort. Known by some as the filming location for Mission Impossible II, and by many others as their dream-like wedding venue, Bare Island offers some of the most stunning and underrated views in Sydney. It was also used as a coastal defence point to protect against invasion into Sydney. It’s only open on Sunday and Wednesdays but if you go on the first Sunday of the month you might pick up some indigenous art at the Aboriginal artist market. In the busy season, you’ll have to book a tour to get out on the actual fort. If you’re not much for tours and markets don’t cross this stop off your list quite yet. The Henry Head Walking track begins nearby and hosts rival views as well as wildlife and ocean breezes. From the Fort, head back and turn onto Cape Banks Road then another right on Henry Head Lane which leads all the way to the trail head. There are various walking distances on offer but the locals say the true highlight is the top of Henry Head and is only a few kilometres from the start. The rest of the walk winds itself along the coast, up and down through the seaside cliffs. 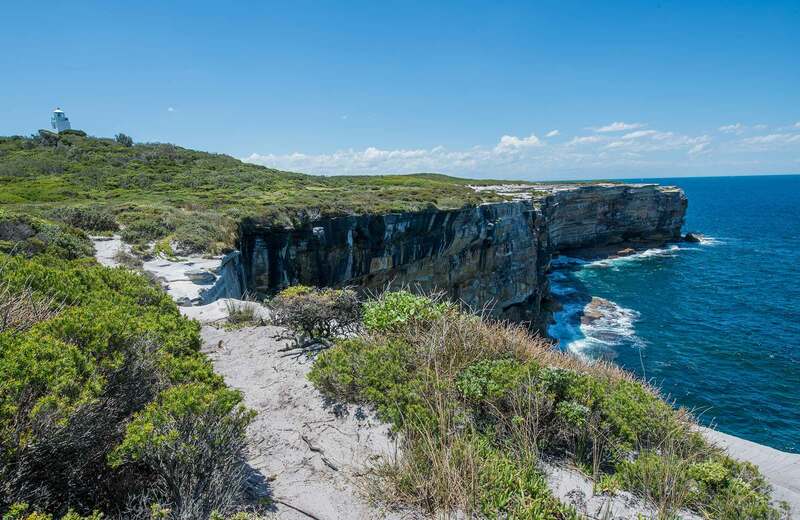 You catch views of Botany Bay and stroll through Congwong beach and catch another vantage point at Brown’s rock. Head into La Perouse when you’ve finished and enjoy the bustling cafe culture. The cliff-side trail along the Henry Head walking track, La Perouse. The next stop can be taken as an adjunct to the first two, but it’s perfectly suitable for a visit on it’s own. 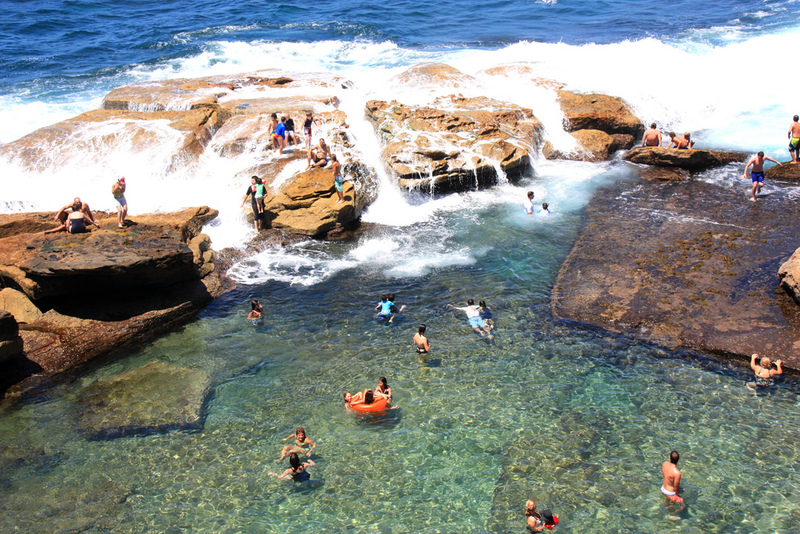 Giles Baths in Coogee can be reached from the city in about 20 minutes by taking the Alison Road exit off the M1 and making your way to Beach street. The baths are a stunning set of natural sea water pools that can be enjoyed safely from the grips of the ocean without missing out on the lull from the waves. “How so versatile?” you may ask. As natural rock pools they form a mostly contained swimming area yet organically allow fresh water to pass through from the gaps between layers of stone. It can be a bit tricky lowering yourself into this refreshing aquamarine swimming hole so it’s best to get in like the locals do- jumping feet first. The baths are best enjoyed on humid summer days with a walk to the nearby cafes afterwards for a treat. Cooling off in Giles baths of Coogee. 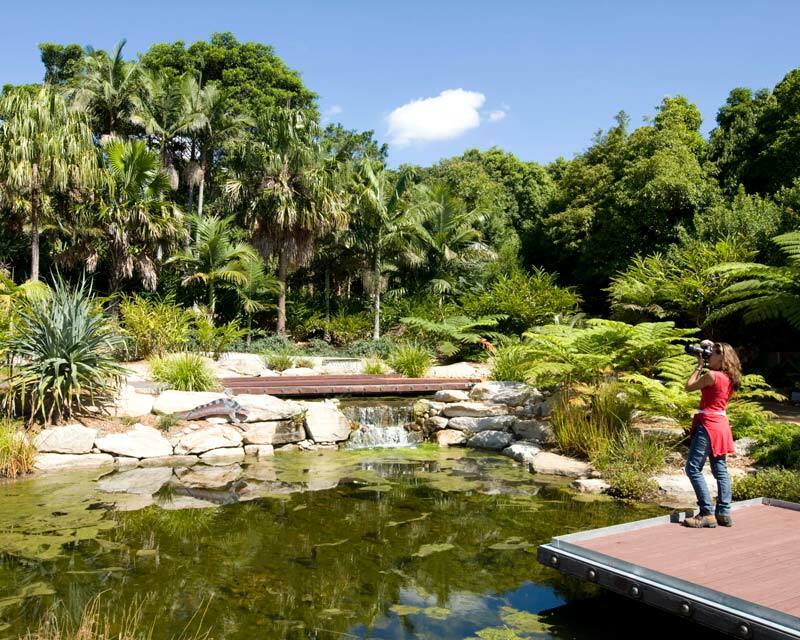 At 59 minutes from the CBD the Mount Annan Botanic Gardens just makes the list. There may be some risk of nudging over the hour mark from traffic on the M5 so leave a little early and sail on through. You’ll need to take the M31 to the Narellan Road exit and follow that until you see the entrance. Before you park you can take the scenic loop around the grounds, or get out and walk on the many pathways through the glorious gardens. There are over 400 hectares on the property, much of which is adorned with native plants with a background of peaceful views. While there is a cafe serving clean and delicious food, they also provide charming picnic areas with free barbecue use if you plan ahead. This stop makes for a sweet solo day wandering in quiet contemplation or an outing fit for larger groups of friends and family. Capturing the serenity of Mount Annan Botanic Gardens. If you’re the type to drive around with your dog in the back seat enjoy the breeze from the window, then this drive is definitely for you. From the M1 to the M2 and the M7, you’ll get to enjoy the entire hour west-ward with your canine companion along for the ride. Off of Springwood road lies the dog-friendly Yarramundi Reserve in the township of Hawkesbury. 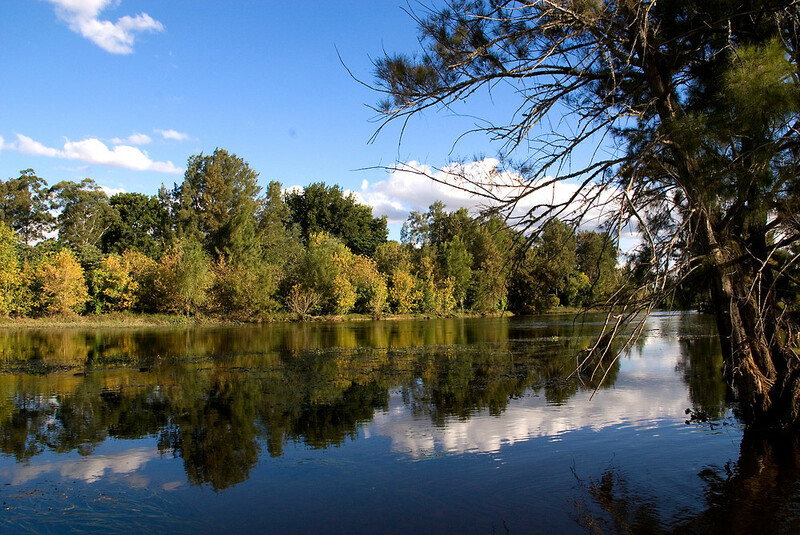 The reserve contains 12 hectares of off-leash dog area and lies at the meeting point of the Hawkesbury-Nepean and Grose Rivers. The clean, calm waters invite you, and your pup, to swim, fish, or head out on a canoe or row boat. If you’re more of the observing type, there have been over 80 bird species identified living amongst the local flora. There is a small toilet block near by and plenty of picnic space for you to spread out. Reflective waters of the dog-friendly Yarramundi Reserve. You don’t need to go far to enjoy the beauty of the Sydney surrounds. If you’re willing to go a bit farther and you’re not finished touring the land, check out our collection of the best view points around Sydney over here.